You might think I’d have an issue with using such an obvious name for a Dimir-colored specter, but I think it works. There are so many things that can be stolen for profit or advantage, and the form of the name is very evocative even to people who aren’t familiar with Garrett and his water arrows. I wonder if they’d have to make a special agreement with Rhianna Pratchett to use the name “Thief of Time” . . .
To partially quote a very old cycle of flavor text, Thief of Sanity really adds injury to injury. It can be read as essentially denying your opponent three cards each time it connects, and the fact that one of those is being taken for your own future use is really demoralizing. If you manage to hit something like Dark Confidant and later cast it, your opponent is going to be in trouble. We often talk about how being in the graveyard is almost as good as being in the hand when it comes to certain cards, but that generally involves selecting which one goes there yourself. I’d still be wary of using it against anything with Golgari cards, but it’s an interesting addition to Magic’s selection of Specters and definitely worth building with. Hello, obligatory Dimir Specter. Thief of Sanity is the latest addition to the noble lineage of Specters, a grand band of swooping terrors that inflict chaos with each successful strike. 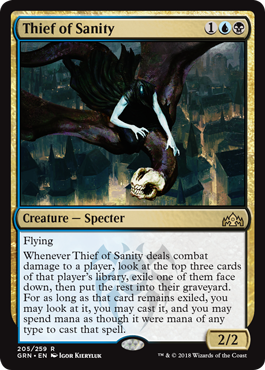 And Thief of Sanity leaves a mark: you mill three cards with each hit, but get the ability to keep the best one for your nefarious purposes to use when it is least convenient for them. A 2/2 body can be a bit shaky insofar as dying to almost any form of removal, but Thief of Sanity leaves a mark whenever it hits, making it a nice addition to the Dimir arsenal of tricks. It may be worth leaving it out of mirror matches or against Izzet/Golgari decks that like a large graveyard, but the promise of potential power is alluring all the same.